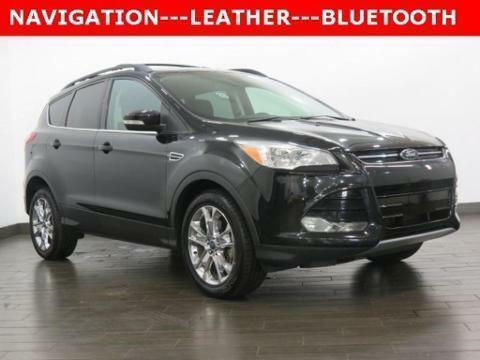 Joe Cooper Ford of Tulsa is pleased to offer this superb 2013 Ford Escape SEL in Tuxedo Black, BLUE TOOTH HANDS FREE, MP3 PLAYER, NAVIGATION/GPS/NAV, LEATHER, NO ACCIDENT HISTORY ON AUTOCHECK, **HEATED SEATS**, **PREMIUM STEREO SYSTEM**, **ONE OWNER**, **POWER LIFTGATE**, **REVERSE SENSING SYSTEM**, and **AMBIENT LIGHTING**. Cargo Management System III (110V Outlet, Black Side Rails & 2 Crossbars, Power Liftgate, and Tonneau Cover), Equipment Group 302A, Technology Package (Hands-Free Liftgate, Passive Entry/Passive Start (PEPS), Remote Start, and Reverse Sensing System), Alloy wheels, AM/FM radio: SiriusXM, Automatic temperature control, Front fog lights, Fully automatic headlights, Heated front seats, Memory seat, Navigation System, Power driver seat, Remote keyless entry, and Security system. Here is another GREAT VALUE brought to you by OKLAHOMA's BIGGEST FAMILY OWNED DEALER. *** Creampuff! This handsome 2013 Ford Escape is not going to disappoint. There you have it, short and sweet! Motor Trend credits the Escape with Euro-chic styling, astute packaging and high feature content. This great Ford is one of the most sought after used vehicles on the market because it NEVER lets owners down. ***CALL 888-680-0566; email us or stop by our location just off the BA Expressway @ Sheridan. One of our dedicated Internet Sales experts will show you an AMAZING buying experience!